Thank you for visiting errorgirl.com! This blog is about the research I carried out with Dr Jane Sutton and Prof Marjorie Weiss into the relationship between mental workload and dispensing errors in UK pharmacies. This research was carried out as part of my doctoral research between 2010-2013. I started writing this blog towards the end of 2011 as an informal way to update participants about the progress of the project, aid recruitment and to publicise the results of the study as and when they are published. This site was also set up so potential participants could find out more about the research and the research team. I am currently updating this blog as I have now finished my PhD and I am hopefully going to use it to write about new research projects. I will also be writing about my teaching because in July I became a lecturer (which I am so excited about – so please expected many enthusiastic posts)! Please bear with me whilst I shift things around on this blog so that it fits with all the new things I am up to! Our contact page if you would like to know more / take part / get in touch. We will also upload findings, publications and conference presentations as and when these occur. Although please note we don’t anticipate this will happen until 2013 as we won’t have collected all of the data until the end of this year. There is also a page of my musings and news most of which are relevant to this research, some have a more general psychology theme and the rest are about being a PhD student/researcher. If you would like to know even more about this study please get in touch with me using the contact form. 19.12.2012 – Just met with the last participant of our community pharmacist study! That is a massive 104 pharmacists who have taken part in our mental workload study. You are all fantastic. Thank you so much! 17.12.2012 – Just met with the last participant for the small follow-up study we have been doing with some of our community pharmacist participants. 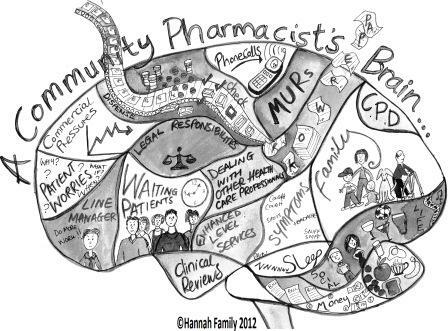 We have been interviewing pharmacists about their experiences of mental workload and it has been such a wonderful insight into the mental pressures pharmacists are experiencing. The blank brains and interviews are going to be the show stopper pieces of this research I think. I can’t wait to analyse the interviews…first we have to type them up word for word – each interview usually takes about a day to write up (thank goodness I have some help on that front from my amazing colleagues Laura and Amanda). 13.12.2012 – Today the research team were invited to London to join many other pharmacy practice researchers and pharmacy leaders for the launch of Pharmacy Research UK a new research charity formed from our two leading research funders PTECO (who funded our mental workload research) and the PPRT. These are exciting times for Pharmacy and for Pharmacy research. 21.11.2012 – Today I became Chair Elect for the South West Branch of the British Psychological Society. I am joining a fantastic team and can’t wait to get started in my new role. In the first instance my new role is supporting our press, media and communications leaders. It’s going to be fun, and I think I am going to learn a lot! Hi Ravi, thanks for your comment and for visiting our website! I think it’s a great topic for research too, although I am slightly biased! Good research from community pharmacy ethnographic qualitative research standpoint and will pave way for reducing pharmacists’ workload and dispensing error.You could work on relative contributions of these three key variables long term. Well done for the innovative methodology. Hi Obabalo, Thanks for your kind comments – I agree there is a lot to work on long term. I can’t take too much credit for the methodology – the tools and techniques we are using have been used extensively in other industries (e.g. aerospace) and we are applying them to pharmacy in the hope that they can be as helpful to pharmacy practice as they have been to other industries. Are you a researcher too?